Earlier this year I worked with Art Director Carolyn Perot on a series of illustrations for the May/June 2019 issue of Mother Jones, which is on stands now. 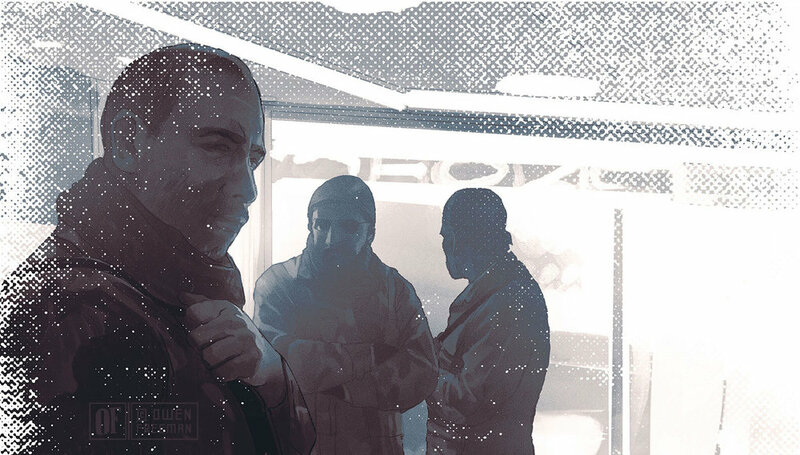 The cover story is the first of a two-part investigation by Shane Bauer in Syria and is an insightful, often wrenching account of life on the ground beneath the fog of the Syrian war. 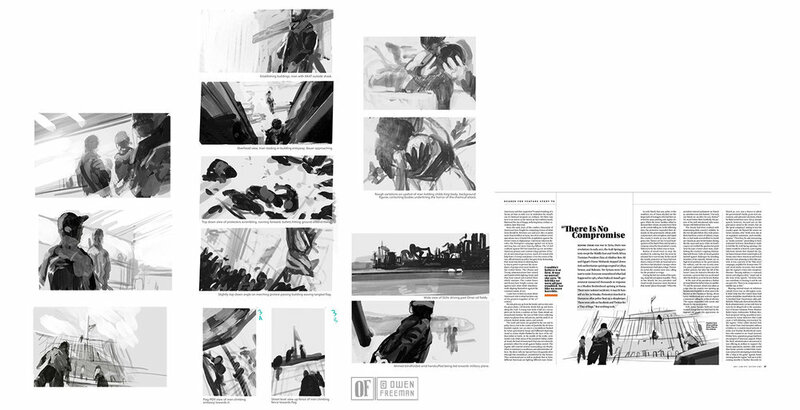 Below are sketches in early development stages, working with the page layouts as they developed was a great help. Also included below are a few illustration influences I looked to on this project to help push myself towards bolder shape design and lost-and-found drawing. Illustration and sketches for The Hollywood Reporter piece “Inside a 'Making a Murderer' Lawsuit and the Hidden Dangers of TV's True-Crime Craze” by Rebecca Keegan. AD Christopher Hawkins. 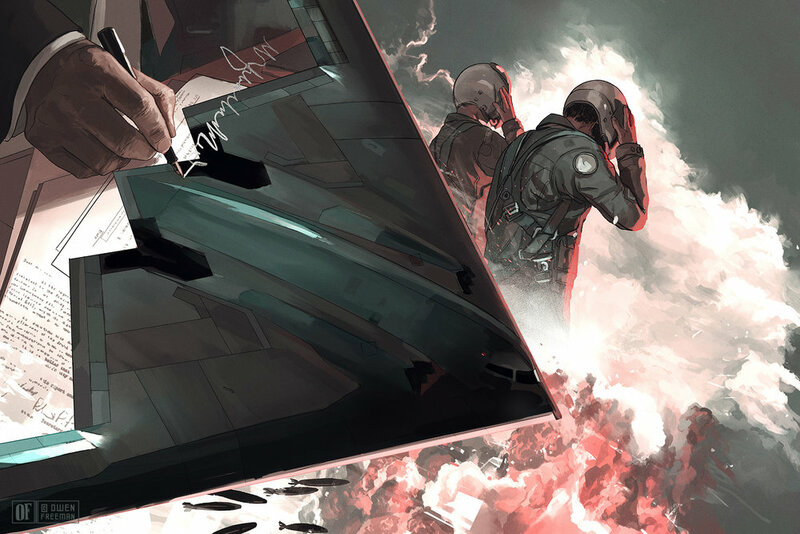 “The Raid” illustrations for a feature story by William Langewiesche on the B-2 Stealth Bomber for The Atlantic. Art Director Paul Spella. A couple more illustrations from earlier this year for This American Life. 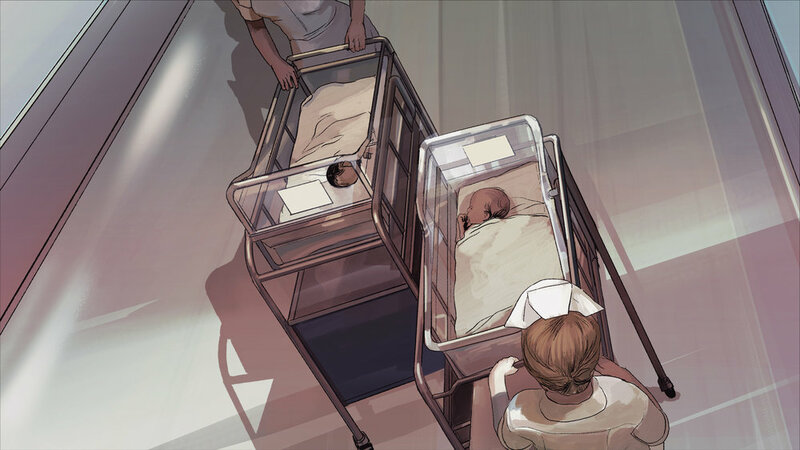 The first, above, "Swtiched at Birth," we follow the lives of two families whose daughters were born in the same hospital on the same day in 1951 in Wisconsin. The aspects of shifting crossover/symmetry in their lives jumped out as key to represent in the drawing. The second piece, "Chip in My Brain," a new episode premiering earlier this year, we follow a seemingly mundane series of events over ten years of childhood as Cody Treybig. The episode is fascinating and unexpected, I highly recommend listening to it. Process sketches below. Thanks again AD Whitney Dangerfield. Happy to report this years Communication Arts Illustration Annual includes a piece that I worked on late last year for The Hollywood Reporter. "Murder, Mayhem and Torture" Off the Sunset Strip" is a true crime piece covering the days and months leading up to the night police apprehended Blake Liebel with the scalped, murdered body of his girlfriend in their Los Angeles apartment. Below are some of the development process for the final illustration. Rough thumbnail sketches to explore the visual elements, tone and composition, and then from there taking the strongest ones to a tighter final sketch to discuss with the Art Director. Ultimately we went with the drawing of the arm and bed melting into the interior apartment crime scene. Thanks again to AD Kelsey Stefanson and everyone at Communication Arts. The latest Jack Reacher film "Never Go Back" is now on Blu-ray, and included with the special edition is an illustrated copy of Lee Child's short story "Everyone Talks" that I had the pleasure of illustrating. The story is a noir glimpse into the Reacher world, and was a lot of fun to develop with the team at Paramount. Thanks again to Rebecca Johnson and Scott Klein for the opportunity. I came across a copy of Vault of Shadows this week, the second in The Nightsiders book series that I illustrated for Simon & Schuster, with Art Director Krista Vossen. Author Jonathan Maberry's second book in the series picks up where The Orphan Army leaves off with young Milo Silk and his friends defending their Louisiana bayou camp from an alien bug invasion. The Vault of Shadows book dives further into the malevolent Huntsman, so we played with a few different designs and compositions emphasizing him in different panes, though ultimately the dark worked best as an anchor and we kept the darker block beneath the title. Below is the illustration for The Orphan Army (The Nightsiders Book 1) and a few sketches, which include some of the design elements that became part of the type template for the set. Thanks again to Krista for the excellent design and spot varnish on the final covers. Both are available now from Simon & Schuster. Cover illustration for the New York Times Book Review of Caleb Carr's latest crime novel "Surrender New York." Art Director Matt Dorfman and I discussed various ways of representing the forensic science elements of the book. Ultimately, we landed on the fingerprint-as-reflection. Full page and spot illustrations for WWD Magazine piece on Sycamore Partners’ Stefan Kaluzny and Golden Gate Capital’s David Dominik's competition for the future of the American mall. AD Oliver Yoo. 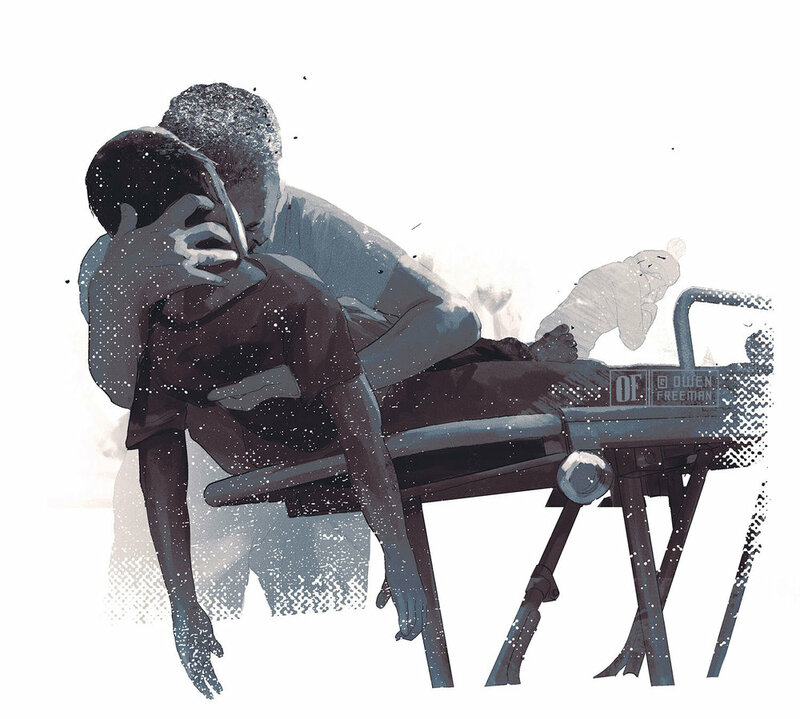 Illustration for a feature on life threatening outdoor scenarios for 5280 Magazine. The opening piece depicts the scene moments after David Torchia's rafting group accidentally went over an 8-foot dam in the Arkansas River. Sketches below show some different approaches to the spread. The final page layout above by Art Director Dave McKenna. 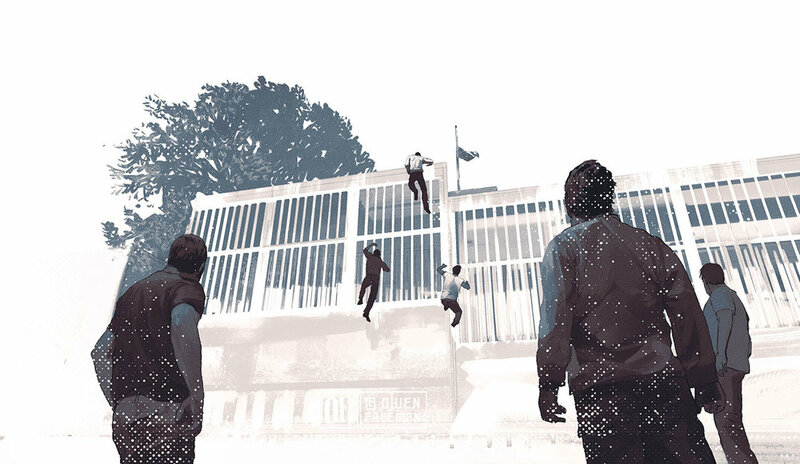 A few new illustrations I did for AD Alex Spacher at Departures Magazine to accompany six pieces by different journalists on the challenges and benefits of traveling in high-risk destinations. llustration for The New Yorker review of American Crime Story: The People vs. O. J. Simpson. AD Chris Curry. I enjoyed the concept of this project, which allowed the narrative to take a turn through sequential illustration and pick back up in the second act of the film. 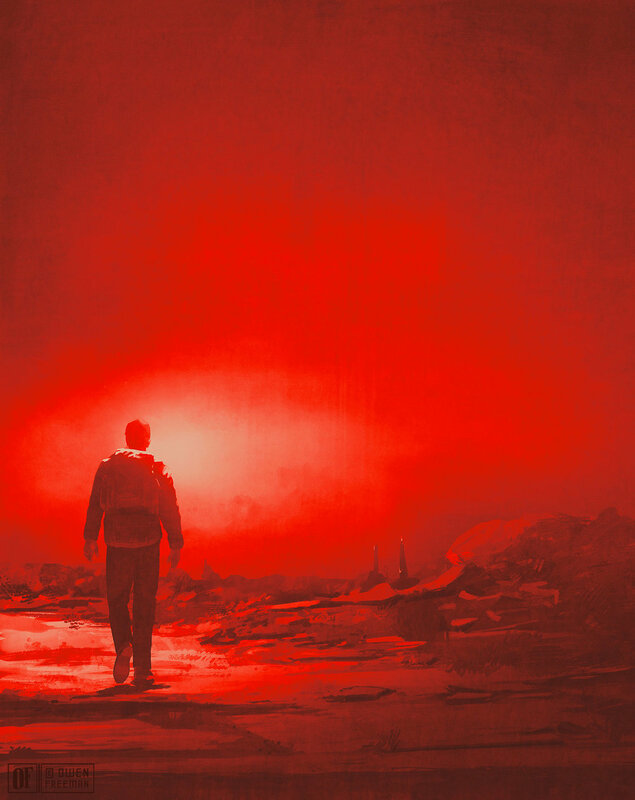 The density of information and events in the story meant that all aspects needed to work in unison to be clear, so color played a significant role in unifying locations and timeframes as well as mood and emotion. The amount of story per page presented a challenge, but was also helpful in that if forced me to pare shots and beats down to the absolute essentials. Having McQuarrie's entire film so well defined was a huge inspiration. It provided an essential structure for the dots that we were connecting with the drawings, and also set the bar incredibly high in terms of visual style and confidence. The entire 8 page story is available online at WIRED.com. Thanks again to Christopher McQuarrie, Dylan Kussman, Jodi Wynne, and Kyle Bonnici for the opportunity. 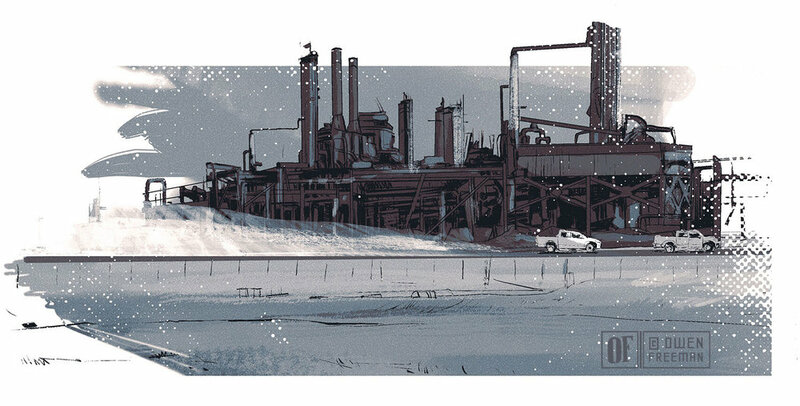 LAZARUS issue 20 hits stands today! Greg Rucka, Michael Lark & Santi Arcas have put together yet another excellent issue building up to the final war-torn chapter of the POISON arc. Working on the Lazarus covers is always an engaging and dynamic process. I actually created two covers for this issue; one before the story really came into focus, and another as it evolved in a new direction. The change of direction provided me with a great opportunity to better convey the nuanced, action-packed moment of the final story, as well as to hone in on what my goals and objectives are for the Lazarus covers. Issue 20 is filled with great combat moments. My aim for the cover was to pull symbolism and visual cues from each of them. One challenge that always arises with the Lazarus covers is the desire to make each one fresh and unique. In that vein, I worked to pull in a different color palette, to provide an unexpected perspective, and to focus on the gesture and movement in the frame. Past covers have been wider and more figurative. In this one I wanted to pull in closely, to the heart of the action, and look at the details - the armor, the pills, the stabbing. The turnaround time for the final cover illustration for this issue was tight. We realized the evolution of the story called for a new cover on a Wednesday and had to have finished artwork ready by Friday. Having Michael’s artwork provided the tone and inspiration I needed to pull ideas together quickly. The clarity and accuracy of his storytelling makes my job as an illustrator much easier when tight deadlines arise, as he provides solid material I can pull from. After sending the illustration to the Lazarus team, the final type layout was designed by Eric Trautmann, who pulled everything together efficiently and with great skill. It’s always a thrill to work with this team and I appreciate their trust and confidence. Art Director Deanna Donegan called me last week for an illustration to accompany a piece about the play Eclipsed. Written by Danai Gurira, the play features Lupita Nyong’o in her Broadway debut. It follows the story of four captive wives of a rebel general during the last days of Civil War in 2003 Liberia. The initial hook of this piece is Nyong’o’s New York stage debut. When I got the assignment, researching the stage play quickly gave way to researching the Liberian Civil War and absorbing as much documentation of that experience as possible. The playwright made a comment in an interview that she saw the violence of the war as a passing darkness eclipsing the light of their lives; that the darkness was transitional. I wanted to invoke that idea in the illustration and to represent the tension of the characters and their experiences as the war drew to an end. The stills I came across from former stage productions of Eclipse revealed a sense of close-quarteredness that piqued my interest. I wanted to capture the essence that emerged from both aspects of research, while presenting an image that reads clearly in a small format. I enjoyed the room for theatricality in this assignment. The theatre provides a controlled, heightened environment. In illustrating a dramatization there is often a bit more breadth to experiment with lighting and color in a fun way, and to evoke a more stylized aesthetic. Deanna, as always, was wonderful to collaborate with, trusting my input, and allowing me to experiment. Lazarus issue 19 by Greg Rucka and Michael Lark is out today! Part three of the POISON arc, bad turning to worse behind enemy lines with the Anvils. Not only is it a really excellent issue but it includes a preview of the upcoming Rucka/Scott Image series Black Magick. And it includes my covers for Lazarus 19 and 20. Whew. Above are a bit of the process for the cover for 19. Early thumbnails for a more action heavy direction, then we got into specifics and the events of the battlefield. A few versions later we arrived at a slightly wider overhead shot with the snowy ground and fallen gear. 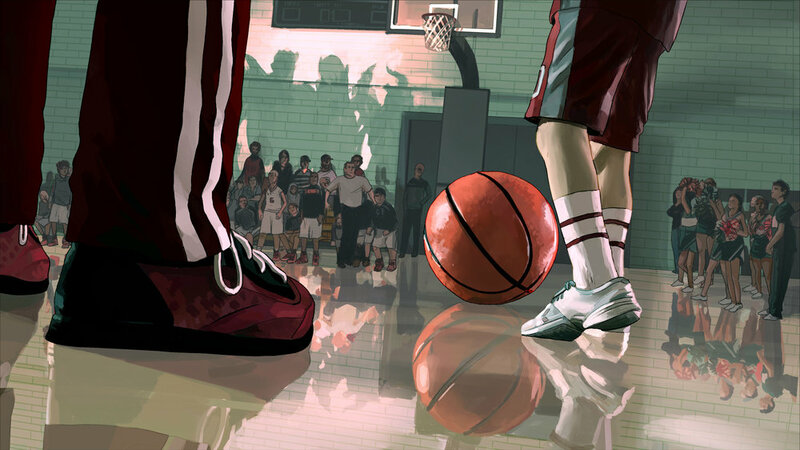 The final illustration was drawn on Bristol board with brush and ink, refined and painted digitally. The original inks and other cover inks are available to buy at Splashpage Art.